In Paradise Bay, players are given the opportunity to achieve the dream of island living. Paradise Bay is a lush island trading post that is in desperate need of a new trade master. At the start of the game, a letter arrives from one of your dear friends. Included are a few pictures of the island paradise along with a request for your assistance. Your mission, if you choose to accept it, is to restore this beautiful island trading post to its former glory. If you choose to accept, sun-soaked adventures await! In Paradise Bay, you have an entire island at your disposal, including natural resources such as rich soil and human resources in the form of friendly island neighbors. You can improve the little village on the island, upgrading buildings and unlocking exciting new things that will make the small community more prosperous and happy. 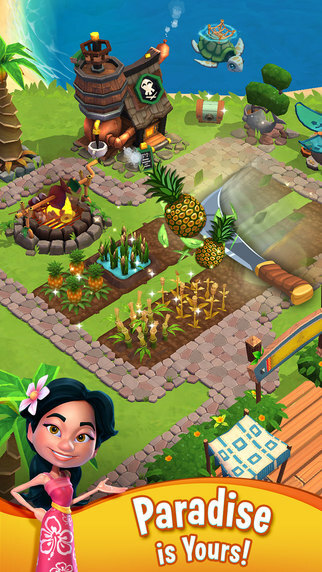 Plant crops, create buildings and get to know the island’s locals. Once production is up and running, you can trade the island’s many goods to earn a pretty penny! Help the local economy thrive! As the new trade master, your goal is to make this island paradise as productive as possible. Plant new crops, acquire new seeds and construct new buildings. There are tons of upgrades to earn and unlock! As you unlock new tools and technologies, you’ll be able to do more and collect more. There are a handful of locals that make their home on the island and your job as the trade master is to establish and maintain positive relationships with all of the people in the tiny community. The islanders will ask you for favors from time to time, and this is a great opportunity to establish goodwill between you and your new neighbors. Each islander has a relationship meter for you to fill, giving you plenty of incentive to grow those friendships! Humans aren’t the only inhabitants of this island paradise. The island and surrounding ocean are home to a variety of colorful, adorable animals. If you build good relationships with the animals of the island, they will do unique and unexpected things in return. Make friends with the animals for success! This game has brilliant 3D graphics that are so bright and colorful, you’ll feel like you have stepped into an island getaway every time you boot up the game. The island soundtrack is soothing and peaceful, setting the mood in a relaxing, charming manner. The gentle lapping of waves against the shore, the faint cry of gulls in the distance, the soft tapping of drums and the melodious trill of wind instruments. It’s a vacation in the palm of your hand! Paradise Bay is an addictive game that has you managing and growing your own little slice of heaven. Machete in hand, feet in the sand. What more could you ask for? 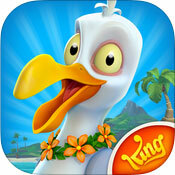 Paradise Bay is the newest game from King Games. Something that makes Paradise Bay unique is the fact that there is not one puzzle in sight. King Games decided to branch out into the simulation genre. Does this new game manage to deliver a satisfying gameplay experience? Read on to find out! The game starts out with a cutscene showing a letter you’ve received in the mail. You open it to find that it’s from an old friend of yours. This friend has been living on an island that has seen better days. She invites you to come and live on the island and help her to restore the place to its former fame and glory. When you arrive on the island, you can immediately see what she’s talking about. The place is a mess, with dilapidated old buildings strewn about here and there. However, the island has a lot of latent potential worth exploring, and with machete in hand, you begin your quest to make the island a productive, happy place once more. There is something inherently appealing about this style of game. You are given your own corner of the world that you can grow and develop, building something from nothing. That’s the charm of simulation games. This small island is inhabited by a handful of charming locals that are each unique and fun in their own way. The zany characters add loads of color and personality to the game, but that’s not all they’re there for. Each of these characters has a relationship meter that you, as the trade master, can fill. Once the relationship meter is filled, that character considers you a close friend. The game offers ample opportunity to improve your relationship with the islanders. When you help the locals with their various tasks, the relationship with them improves. Happy neighbors, happy island! In addition to nurturing those human relationships, there are a variety of animals for you to get to know was well. These animals are bright, colorful and adorable, adding a unique twist to this island game. Curious cats, glossy-eyed otters and wide eyed turtles are just a small sampling of the animals you’ll get to meet in this game. Paradise Bay lets you grow bamboo, cotton, juicy pineapples, and much more. Collecting these crops is a hands on thing that incorporates the touchscreen. Use your fingertip to control your machete and harvest those goods. The graphics are so rich and vibrant that you’ll find yourself craving pineapple slices and coconuts in no time. In addition to abundant crops, the game has islands for you to discover and explore along with new technologies and buildings to construct and take advantage of. 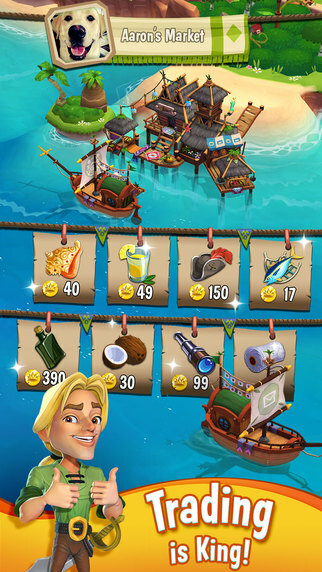 As you increase your reputation among the locals of the island and become a better trader, you’ll find more opportunity to earn money and gems that may be used to unlock yet more things. Collect them all! King Games is known for bright, colorful games. They tend to have a lot of eye candy, no pun intended. Paradise Bay goes above and beyond anything that I’ve seen from King Games to date. The graphics are bright, colorful and impressive in 3D. The animations are a welcome surprise that makes the game feel more like an animated show than a mobile app. The scenery of the island is gorgeous, and the characters blend in well with this gorgeous world. The music and sound effects are also top notch. You can hear the ever present water coming to rest against the shore. You can hear the sound of birds in the distance. The music of the island is relaxing and soothing, with gentle drumming and pleasant wind instruments throughout. Overall, the production value of this game is superb, proving that King Games aims to improve with each game they come out with. Without a doubt one of the most beautiful apps of the year. This is a free to play game, and like King’s other games, revenue is generated by in-game purchases that are optional. Unfortunately, Paradise Bay is borderline impossible to play if you do not make in-game purchases. The game starts out being fairly generous regarding the requirements needed to complete objectives. However, as the game goes on, it becomes harder and harder to fill the orders that come in within the time limit. Storage space is limited, making it impossible to stockpile the goods that people will end up ordering later. Fruit trees are a constant problem that is frustrating and annoying both. If you purchase a fruit tree, there is no guarantee that it will live a long, healthy life. This is fairly realistic, so props to the developers for including something like that. However, in order to get rid of that dead, lifeless tree, you’re going to need an axe. The problem is, axes are inexplicably rare. If you can’t get your hands on an axe, you’re going to have dead trees all over your island. Those dead trees take up precious space that could be used for productive plants. The limitations of the game are clearly crafted to force players to make in-game purchases. Though somewhat understandable, these frustrating limitations will be a major con for any player looking to play through this game without spending a small fortune in in-game purchases. In the beginning of this game, it’s quite exciting to unlock new buildings, build new relationships, and discover new animals. However, as the game goes on, everything starts looking and feeling the same after a while. If you ever played FarmVille or any of the other farming sims, you know how repetitive they can get. In terms of long-term replay value, it’s very much a your mileage may vary type of thing. Some players have endless patience with doing basically the same quest or task over and over again, while others end up abandoning a game when everything starts looking the same. There is a lot to love about Paradise Bay. It’s a visually stunning game that has been built with quality and care, with memorable characters and impressive sound effects and music. The intentional limitations built into the game to encourage in-game purchases are indeed frustrating, but the game is still very much worth downloading, if only for the first levels. It will be interesting to see what King does with this game in the future since they are well known for providing frequent updates. Overall, Paradise Bay is worth downloading for fans of FarmVille and other similar farming sim games.